Background Stable housing is the cornerstone of effective psychiatric treatment, especially treatment for the most vulnerable and marginalized patients—those with schizophrenia. Hurricane Katrina was a disaster of epic proportions that uprooted an entire region. Some residents were temporarily dislocated, whereas others faced more permanent moves. Methods The purpose of this retrospective chart review was to examine the housing of schizophrenic patients treated at an area health system before and after Katrina. We sorted patients into 4 living arrangements: living alone, living with family, living in a supervised setting, and homeless. Results We reviewed 300 charts, and 69 patients met the inclusion criteria. Contrary to our initial assumptions, this population showed a marked degree of stability and cohesion: Nearly 90% had no disruption in their living configuration after the storm. This finding may in part be because nearly 75% lived with family, in addition to specific characteristics of the health system. Conclusion We believe that the results demonstrate the resiliency of the region and its people. A critical component of the treatment plan for patients with schizophrenia is a supportive environment and stable living arrangement. Ideally, this living arrangement is static across time. Housing changes are incredibly frequent among those with a mental illness and must be taken into consideration when planning outpatient management.5 This retrospective chart review compared and contrasted the living arrangements of schizophrenic patients cared for by the staff of a psychiatric department (comprising both an inpatient unit and outpatient clinic) before and after Hurricane Katrina passed through the Gulf Coast region on August 29, 2005, and resulted in large-scale property damage and significant disruption. We also examined the stability of the living arrangements of individual patients who remained in the region after the storm. These issues are crucial factors when planning for the care of schizophrenic individuals as the area and institution prepare for future storms. An institutional review board–approved retrospective chart review served as a framework to view the impact of natural disasters on patient populations living with mental illness. Included were patients who were diagnosed and treated for schizophrenia at Ochsner Clinic Foundation from January 2000 through February 2011—before and after Hurricane Katrina—and who were 18 years or older during treatment. Data on patients meeting the inclusion criteria were obtained from medical records. Patients diagnosed and treated for schizophrenia were selected based on history, which in some cases included a psychiatric admission prior to Hurricane Katrina and/or a subsequent admission after the storm. Some patients were seen exclusively as outpatients in the clinic. We evaluated patients' housing situations before and after Katrina and sorted housing status into 4 categories: living alone, living with family, living in a supervised setting (ie, group home, nursing home, assisted living, or prison), or homeless. We entered the results into a database for analysis. Of the 300 charts examined for this study, 100 patients met the inclusion criteria. Of these 100 patients, only 69 had a full set of data points identifiable in the chart. Table 1 summarizes the demographics of the cohort. Women outnumbered men nearly 2 to 1, comprising 60.9% of the cohort. Patients were nearly equally split between Caucasians (52.2%) and African-Americans (46.4%); only 1.4% of the patients were of Hispanic origin. Fewer than half of the patients were married (39.1%); 52.2% were single. Relatively few patients were widowed (5.8%) or divorced (2.9%). Of the 69 patients included in the study, only 9 (13%) had a different living arrangement after Hurricane Katrina (Table 1 and Figure). 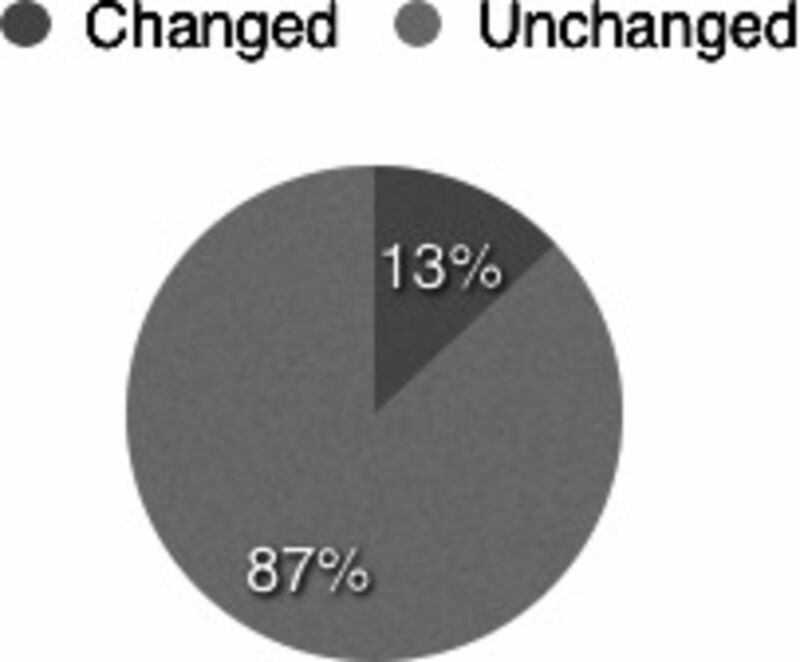 Most patients lived with family before (72.5%) and after (71%) the storm. Prior to Hurricane Katrina, 17.4% lived in a supervised setting—group home, nursing home, assisted living, and prison (1 patient)—while 15.9% lived in a supervised setting after the storm (the individual who was in prison prior to 2005 was homeless in 2006). Finally, an equal number of patients (5.8%) lived alone before and after Hurricane Katrina, but homelessness increased from 4.3% to 7.2% before and after the storm. Schizophrenic patients' living arrangements pre- and post-Hurricane Katrina. Table 2 shows the demographics of the subset of the 9 patients who changed living environments after the storm. Compared to the full cohort, more were men (44.4% vs 39.1%) and African American (66.7% vs 46.4%); fewer were single (44.4% vs 52.2%), married (33.3% vs 39.1%), or divorced (0% vs 2.9%); and more were widowed (22.2% vs 5.8%). The average age was also slightly older: 62.3 years vs 58.7. Table 2 also shows the living arrangements of this subset of patients who changed settings. Within this cohort, an equal number lived alone (22.2%) pre- and post-storm. The number living with family declined from 44.4% to 33.3% before and after the storm, respectively, and roughly equal numbers in terms of statistical significance lived in supervised settings (22.2% and 11.1% pre- and post-storm, respectively). Within this cohort, the number of homeless patients increased from 11.1% to 33.3%. Table 3 shows the subset of patients who had the same living arrangements before and after Hurricane Katrina. Compared to the full cohort, the demographics differed little. Given the widespread devastation suffered by the region during Hurricane Katrina and the subsequent exodus of a sizable portion of the population to all corners of the country, we expected to find a significant disruption in the living arrangements of our cohort after the storm, especially given this particularly vulnerable and marginalized population. However, the results showed that the vast majority of patients did not have a change in their living configuration after the 2005 Gulf Coast hurricane season. Because of the small number of patients in the study who experienced a change (n=9), we can make few comparisons of this subset to the entire cohort. Although we can only speculate about the underlying forces and factors contributing to our findings, several possibilities come to mind. Perhaps the most telling finding was that approximately three-fourths of all patients lived with family before and after the storm, which appears to be a protective factor for our cohort. In addition, examining the health system itself points to other potential explanations. Ochsner is a private health system, and its main campus (the primary site of the psychiatric department) is located just across the Orleans Parish line in Jefferson Parish. The facility was not damaged to any considerable extent during the storm and remained open during the entire hurricane season (through November). The psychiatry clinic primarily serves patients with private insurance and Medicare who tend to be a more stable population than patients with Medicaid or who are uninsured. The inpatient psychiatric unit at Ochsner has a roughly equal mix of privately insured, Medicare, Medicaid, and uninsured patients. Although the inpatient unit includes Medicaid and uninsured patients who would tend to have higher homeless and change rates than privately insured and Medicare patients, at 12 beds, the unit accounts for only a fraction of the patients seen by department physicians, so the number of Medicaid/uninsured patients is therefore likely diluted. Whatever the causes, the findings undoubtedly speak to the resiliency of the people in this region, even those who comprise the most vulnerable and marginalized of the population. This article meets the Accreditation Council for Graduate Medical Education and the American Board of Medical Specialties Maintenance of Certification competencies for Patient Care, Medical Knowledge, and Systems-Based Practice. (3, 1991) Housing instability and homelessness among rural schizophrenic patients. Am J Psychiatry 148(3):330–336, pmid:1992835. (1, 1988) Housing the homeless mentally ill: a longitudinal study of a treatment approach. Hosp Community Psychiatry 39(1):40–45, pmid:3338726. (2003) The schizophrenia prodrome revisited: a neurodevelopmental perspective. Schizophr Bull 29(4):633–651, pmid:14989404. (1, 1979) The outcome of severe acute schizophrenic illnesses after one year. Br J Psychiatry 134:28–33, pmid:760920. (1984) Housing change of chronic schizophrenic patients: a consequence of the revolving door. Soc Sci Med 19(7):759–764, pmid:6505744.